Planning is in full swing for Boulder Startup Week ‘19—our 10th Anniversary Celebration. We are getting just as excited as you, and are eagerly anticipating this week full of networking, education, and fun. It’s no secret that startup accelerators provide invaluable support to startups through connections, mentorship, and seed investment. Colorado is incredibly fortunate to be home to some of the best accelerators in the world, and Boulder Startup Week brings these leaders together to share opportunities to help accelerate your startup to the next level. The Adventure Track – Pushing the limits of human performance and unleashing human potential. Who should attend: Those that are interested in the latest technologies, practices, and debates surrounding human performance and human potential. Open daily 8am to 5pm, Basecamp is a place for BSW participants to orient themselves, grab a free Boulder Startup Week T-Shirt (while supplies last), and engage with local startups, entrepreneurs, and innovators! Boulder Beta hosts the BSW opening party for attendees to mingle and to check out 10 of the hottest startups in Colorado. We invite a diverse group of founders to demo their exciting products. Anyone looking to network and kick off BSW the right way should attend! As one of the fastest growing industries in the country, cannabis offers huge opportunities for entrepreneurs; But its fast pace also makes it hard to keep up. This year, the cannabis track will focus on trends in the industry, how startups can develop the space and get everyone up to speed on a space that ages in dog years. Climate Change is our worlds greatest threat as well as our greatest opportunity with endless possibilities for creative action and community building—and we have more people working in the field in Boulder than anywhere else in the world (per capita). For the second year, BSW’s Climate Action Track will bring together thought leaders for hands-on problem solving to help push the dial on climate action in Boulder and beyond. The creative track for BSW promotes programming that ignites participants creativity and ideas. The purpose of the creative track is to provide participants with hands-on experiences to learning new techniques and new ways of processing and thinking. The data science track brings together events related to machine learning and AI, data ethics, and tooling for data science. If you’re a current or aspiring data scientist, or your company is exploring data science and machine learning strategies, this track is for you! Design is critical in developing products that solve complex problems. Events in this track take up design in a broad sense, from conducting user research to the ins and outs of designing digital products. The Education track provides a taste-test to our burgeoning education startup & innovation ecosystem in Boulder and our surrounding communities. We’ll have events to showcase our diversity of startups, organizations, and educators, and focus on topics ranging from Innovation in Early Childhood to Ignite-Style Storytelling from K-12 Entrepreneurs & Intrapreneurs. This year the energy track is expanding to new grounds. Look forward to talking about new energy efficient transportation startups. Along with hosting a live podcast about communities and startups working with energy, tech and utilities. We’ve added an interactive event where we’ll build ideas to decide where the money for clean energy from grow houses could go. We’re eager about this list of new, but as always, get excited about the Energy Nerds Happy Hour where we can recap the week and talk about all things energy. We can’t wait for the 10th year of Boulder Startup Week and the energy track! How does equity bring value to your bottom line? How do we translate the equity practices familiar to HR and D&I, across the business environment, from UI/UX, to product management? Together we’ll learn solutions you can apply in your business today— solutions that not only increase the equity of your startup, but contribute to your valuation. The finance track is focused on providing actionable information on how to start and grow your business from a finance and accounting perspective. From setting up your systems for success to raising money and managing your cash flow. There will be something there for every stage of startup from idea to IPO. The 2019 Food Track is going to be big and delicious! In addition to the traditional CPG focused events expect to learn more about new age trends like e-commerce, big food system issues like food waste, innovation and opportunity across the food value chain, the role of technology in food and agriculture, and even a potential farm tour to reconnect with our Boulder farmers! 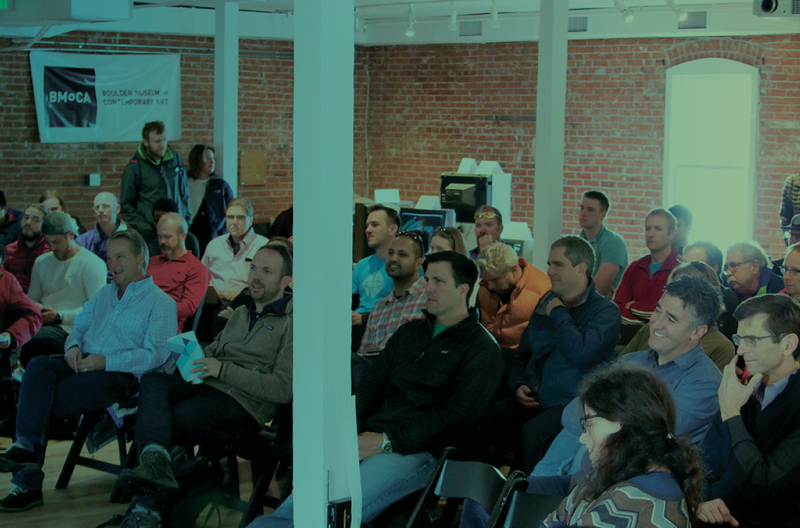 The HR and Talent Acquisition Track at Boulder Startup week is meant for HR/TA professionals as well as job seekers. We’ll discuss Diversity & Inclusion, Scaling at a StartUp, Resume Reviews, Employee Appreciation and much more. We are really excited to share some of our exciting events with you! Do you invest in startups or are you raising a round? The investor track hosts talks and events on the latest in investing. Topics range from the venture landscape in Colorado to alternative funding vehicles. The Legal-Entrepreneurship track provides practical guidance to founders, investors, executives and employees of high-growth companies. Topics will include structuring investment deals, nuances of equity compensation (for employees and employers), how to read a “cap table”, early stage due diligence pit-falls, and big picture contract issues. Intellectual Property (IP) problems are expensive to fix — whether you get sued for infringement, someone else copies your product, or a potential investor asks to see your code, IP issues can be anticipated and nipped in the bud. The Legal – IP track events will arm you with the knowledge and resources every entrepreneur needs to get on the right track from the start. Successful marketing is key to getting people interested in products and services, especially for startups. The marketing track will share the latest in marketing strategy, digital marketing, analytics, paid media, and more. Whether you’re the next big SaaS company or a new chain of trendy ice cream shops, you’ll gain the knowledge to take your company to the next level and grow your business. Are you new to town or want to meet more amazing people that call Colorado home? This track focuses on welcoming you and providing amazing ways to connect to new friends and discover community and Boulder’s startups. For the first time in Boulder Start Up history 2019 will include a track for everyone with an interest in learning, experiencing and networking with professionals who have an expertise in the world of non-profit organizations, which have a very large percentage of the workforce and contribution to GDP. Whether you are interested in starting a non-profit, working in a non-profit, reinventing your current non-profit or meeting people from the sector, the BSW2019 non-profit track will have something for you! The Boulder Startup Week 2019 mentor office hours provides a rare opportunity for aspiring entrepreneurs to have personalized time with an established business leader to discuss their latest projects. The track features a 2-hour time block where entrepreneurs will seek thoughts from mentors in 20-minute one-on-one sessions. The Product track will explore how to explore, iterate upon, and grow a product that solves real problems. Does your startup produce physical products? This applies to a wide range of companies and products but often have similar challenges. From concept to manufacturing, financing to sales, marketing to logistics, the Boulder Startup Week Physical Products Track examines and discusses all of these challenges and more. Come meet and interact with executives from a wide variety of makers. Customer Success is a way of doing business where the entire company is focused on proactively addressing the customer’s product adoption, satisfaction and growth after the sale. This track will address such topics as what it is/isn’t and how to get started, explore the role Sales takes in conjunction with CS in delivering a One Company experience, Real Stories from local Tech Startups on how CS influenced their growth and how hiring “right” & the customer centric culture is the foundation for obtaining customer satisfaction. A series of experiential events focused on how our work can be a vehicle for powerful, positive impact. These events are for you if you’re serious about making a difference and want the tools, connections, and personal transformation to make it happen. This year, the Sustainability Track will focus on the solutions – that have been created or could be created – to solve the complex financial, social and environmental issues, and the challenges and opportunities under Sustainability. We will highlight areas such as transportation, water, the outdoor industry, companies that have integrated sustainability into their processes, and resources startups can leverage in the local area to help them build their businesses. Universities and startup ecosystems go together like peanut butter and jelly. (Stanford and Silicon Valley, MIT/Harvard and Boston, CU Boulder and Boulder.) Learn about CU Boulder’s role in helping attract and support amazing entrepreneurial energy for Boulder and beyond. The internet as we know it, Web 2.0, is rapidly transforming into a centralized system of mass surveillance. The most well-known platforms of today (Facebook, Google, LinkedIn etc) are incentivized to operate in ways that frequently violate the values of their users. The vision of web 3.0 is a more equitable internet rich with: privacy, self-sovereignty, digital freedom and autonomy. Come learn about everything that is being done to address the problems of web 2.0 and how you can start transitioning into web 3.0 today. Traverse the divide between you and your work, delve into your identity and mission, and create a framework to support your goals. Bring all the hats you wear for cross-disciplinary conversations–no matter where you are in the process. The WILD track is a condensed version of the former WILD Summit, focusing on shattering ceilings, breaking molds and challenging gender status-quo as we forge brighter futures for women in business and leadership. Join us on May 16th for candid conversations on relevant and provocative topics that celebrate women’s startup success, diversity power and leadership impact. While you wait for the schedule, there are still opportunities to get involved. BSW is running a survey to get community input on the types of events you would like to see. Please take a moment to complete the survey to make sure that we cover what is important to you. There are also many chances to be involved through volunteer and sponsorship opportunities.